The foreign exchange market (currency, forex, or FX) trades currencies. It lets banks and other institutions easily buy and sell currencies. The purpose of the foreign exchange market is to help international trade and investment. A foreign exchange market helps businesses convert one currency to another. For example, it permits a U.S. business to import European goods and pay Euros, even though the business’s income is in U.S. dollars. In a typical foreign exchange transaction a party purchases a quantity of one currency by paying a quantity of another currency. The foreign exchange market is unique because of … the extreme liquidity of the market [and] the variety of factors that affect exchange rates. As such, it has been referred to as the market closest to the ideal [i.e.] perfect competition. My dire ‘doomed to failure’ prediction comes about because of that last sentence: FOREX “has been referred to as the market closest to the ideal [i.e.] perfect competition”. Think about it: for every dollar, drachma, or rupee that you buy … somebody has to be on the other side selling. And, since you are ‘betting’ on the relative strength of one currency versus another, you are effectively betting opposing arguments. You have the same points spread on the ball game, but you are betting on opposing teams … one winner, one loser. Now, who do you suppose has better information? You, or the other guy? 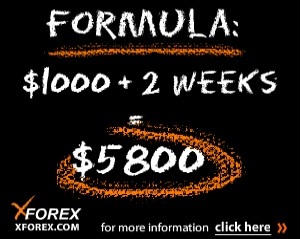 Who do you suppose has better FOREX training and more experience? You or the other guy? Which all be true and yet another reason why you are gambling and they are expertly managing their portfolios. So, that means that 50% of the traders out there must be winning and the other 50% losing? Well, the stats – somewhat surprisingly – tell a different story; cast your mind back a few weeks, where taloudellinenriippumattomuus mentioned a Taiwanese study that found that (after costs) only 0.16% (or 1.6 per thousand) of traders [AJC: in this specific case, Day Traders, but I doubt whether FOREX or stock option traders fare much better] actually made a profit! This entry was posted in Starting Out, Uncategorized and tagged 7million, 7million7years, Investing, millionaire, money, Rich, Starting Out, wealth by Adrian. Bookmark the permalink. This is the problem with trading systems which are zero sum games like futures and options (actually negative sum after costs and taxes) – in order to win you not only have to take money off someone else (or a hedger or end user) but you have to do it with sufficient frequency to make the effort worth while. For instance I sell a way out of the money covered call, I want the little bit of cash it produces, and I want to sell it if it gets that high. The other guy wants to buy a cheap option at that price. If it hits that #, didn’t we both get what we want? I’ve always wondered about people who tried to take on the banks and financial institutions. It’s like standing in front of an elephant and trying to steal food off him. All he has to do is put one foot on you and you’re DEAD. Amazing how so many people who know nothing about something, decide that because someone who they don’t know can tell them the answer to their life’s money problems, they blindly follow hoping all will work out. It’s like a mirage. Looks really great from a distance but when you approach it there’s nothing there to get a hold of!!! lenders, market makers, fund managers, banks / brokers, trading “educators”. There is money in day trading if you are on the right side. Why wait two weeks you could turn $1000 to $35,000 in one spin of the roulette wheel in Las Vegas and get free drinks! The problem of course is that while making large sums gambling or speculating is possible is ISN’T very probable. The chance of winning a straight up roulette bet is 1/38 or 2.63% so more than 97% of the time you go home broke. It seems speculation has even worse odds. Any money I’ve made in FOREX has been through just plain dumb luck. For example, I worked for a British multi-national while living in Asia between 2006 – 2008, my base salary was in Pounds but every month I would have the company convert this to US dollars (at bank rates) and wire to my US based account- wasn’t a problem for them as they are a multi-national and hold lots of currencies. I got lucky converting Pounds to dollars in the two years where the pound was the strongest (exchange rates varied between 1.87 – 2.10 dollars to the pound, today is about 1.63). In early 2008 I left the company and any remaining money I had in pounds I converted to Singapore dollars. Now I wasn’t fast enough to exchange USD into Australian dollars when the AUD plummetted so I still held on to USD based on the fact that I would need to ultimately spend in USD when I move back to the USA. Win some lose some I guess. I tended to use multi-currency to hedge between US & non-US currencies, and tend to sell one currency when it is stronger and buy the weaker one then reverse the process when the cycle changes. Not major gains to be made but a bit here and there and it’s kind of fun to pursue this low level gambling. Never tried the FOREX Markets. Just seemed to me to be to much of a gamble.I looked at the situation on one of those sites that allows you to play with fake money. Still didn’t impress me . Not much of a gambler I guess. At least you’re having fun! @ Adrian, LOL. In this having fun doesn’t mean maximizing returns. But I’m ok with that, at least in this moment in time…. @Evan: but wasn’t that initially what options where designed for, as an ‘insurance’ to be able to buy or sell underlying values? I think the problem arises when people start speculating heavily out of the money with short time spans, for example buying a put option hoping that the markets collapse, without actually owning shares. I am not an expert on forex, but wasn’t it originally designed to cover for the risk of devaluation?